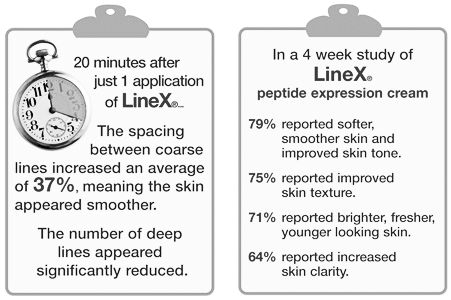 Stubborn Wrinkles Surrender to the Power of this Lotus-Peptide Line Smoothing Complex! Thousands of daily facial movements cause expression lines that deepen over time. Clientele to the rescue! Sacred Lotus plus Liposomal Hyaluronate fills in skin lines with moisture and smooths the appearance of lines and werinkles. Ceramide-3 complex, Shea Butter and Olive Squalane help smooth the skin's surface. Peptides Peptamide 6, ChroNoline™ and Syncoll™ are very gentle and highly effective. It also contains Raffermine™, rich in glycoproteins and purified polysaccharides for collagen support and firming the skin. I was lucky enough to try a sample of this new formula and found it much easier to apply than the old cream. It did a great job smoothing the lines on my forehead too. This night cream has made my skin hydrated and I feel the difference!!! I have tried many creams and this one really helps me...Thank you! I love the Firming Night Cream it feels good going on I would recommend this to everyone! Been using this product for about 15 years......LOVE IT!! My skin looks much younger than my stated age and I attribute it totally to this product!! Ive tried many during that time period but always come back to this product because its the only one that actually works! !